As technology becomes more and more accessible our clients are becoming increasingly more aware of what is possible with image retouching software like Photoshop. I asked a client of mine about a recent shoot they had with another photographer, their response was painfully honest. "We loved his lighting and ideas but when we got the images back we weren't happy with his Photoshopping. The skin on the model looked awful. As a photographer you should be able to offer both fantastic photography and great retouching all in one package. We won't be using him again". This was an unprovoked response and I made no leading questions about retouching but it does prove to me that from a clients point of view, it's about the final image not what you did to get there. In my field clients are expecting to receive a 'perfect' image, they are expecting to see flawless skin, tidy hair and sparkling eyes. Some of them may not realise that these images have had any retouching done at all, they may even believe it comes out of the camera like that but they are expecting to see it looking perfect regardless of how it got there. Raw on the left and final retouched image on the right. It is clear to see that the final 'client ready' image has had a personal preference and style added. Photography and retouching by Jake Hicks Photography. 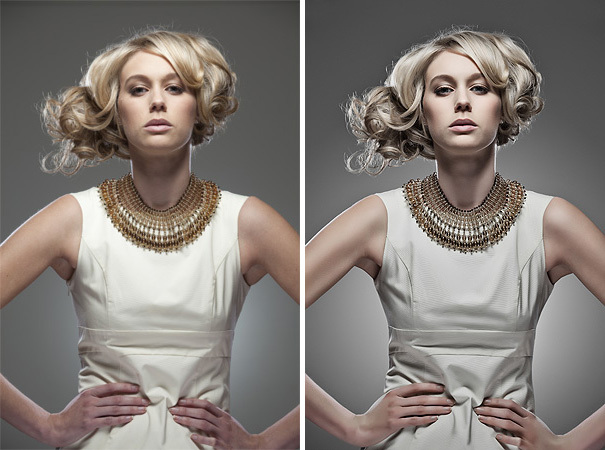 Do you retouch your own images? "Do you retouch all your own images or outsource the retouching to freelancers". "Of course I retouch my own photographs, I took them". "Of course I don't retouch my own images. I don't have the time for that, I pay a retoucher to do the boring stuff". Clearly the reasons for doing post-production yourself or getting others to do it are numerous but does it really matter? Isn't it the final finished image that's important, not how you get there? Often with more commercial work like this shoot for a jewellery brand, the images need to be clean and simple with very limited creative input into the post pro of the final shot. Before on the left, final on the right. Photography and retouching by Jake Hicks Photography. There has always been 'post' production on photographs after the initial shutter release, whether it be in the digital dark room of the modern day or the wet darkroom of film, photographs have always had something added or taken away from them before public consumption. The famous American landscape photographer Ansel Adams (1902 - 1984) notoriously spent weeks in his dark room perfecting his vision of the image he had in his minds eye with stunning results. Although Ansel Adams was clearly a very talented photographer with a keen eye for composition and technical ability, it was his ground breaking darkroom skills and techniques that ultimately made his work famous. Conversely the French photographer Henri Cartier-Bressson (1908 - 2004), considered by many to be the father of modern photojournalism never developed his own film or processed his own images. Cartier-Bresson is famous for his outstanding ability to capture a moment with his camera, his work made famous by the candid nature of the content not how the image was processed. He saw the value in his time being spent out shooting not in the darkroom. The same argument clearly applies to modern day photography, albeit a lot more diverse in its implications. Modern photojournalism has strict rules on post production that all photojournalists must abide by. Essentially no post production is allowed, just basic colour correction and dust removal is accepted. At the opposite end of the spectrum we have editorial and beauty photographers whose images have 10-20 hours of post production work spent on them to ensure the image fits the visual 'ideal' of a given campaign. Whether the photograph has had 5 minutes of tweaking or days of pixel punishment it's the final image that is important to the viewer and our clients, they don't care how we got there and in my opinion, nor should they. As a photographer I know my clients trust me with their briefs because they love the work that I have already shown them in my portfolio. Remember I am not saying they love the 'photographs' that I capture because that is not what I show them, they see the final representation of that photograph as I want them to see it and sometimes this can look different to the original image captured. This is my style and workflow, I retouch all of my own photographs with my own vision of how I want them to look and that vision is personal to me and me alone. If I was to take the photograph and get somebody else to do the post production work the the final vision would inevitably look very different to mine and that is what I am trying to highlight here. To illustrate my point of how the post production of a photograph can determine how the final image is portrayed I sent out the same RAW unprocessed file to several professional retouchers from around the world. "You will be supplied with a RAW file from a commercial studio shoot and asked to retouch it to an 'editorial' standard, please visit my website to see the standard of work already being produced". They were also asked several questions from myself with regards to understanding their profession and the photographer/retoucher relationship. The results are highlighted below and it is clear to see that they all brought their unique interpretation to bear on the final image. Like Ansel Adams, I enjoy my post production workflow, I enjoy the process of getting the very best out of my photographs where I have the ability to accurately influence the final image with my unique vision. I believe that the time spent on this is cost effective because like it or not these results are what my clients expect. That being said I know plenty of very successful photographers who take Henri Cartier-Bressson's approach. They feel that their time is better spent behind the lens, or simply accept their retouching limitations and outsource their work to focused retouching professionals who, with their years of experience and up to date knowledge of the latest digital tools, can efficiently refine their photograph. Raw on the left and final retouched image on the right. Here again the colour toning applied in post is personal and subjective. Photography and retouching by Jake Hicks Photography. 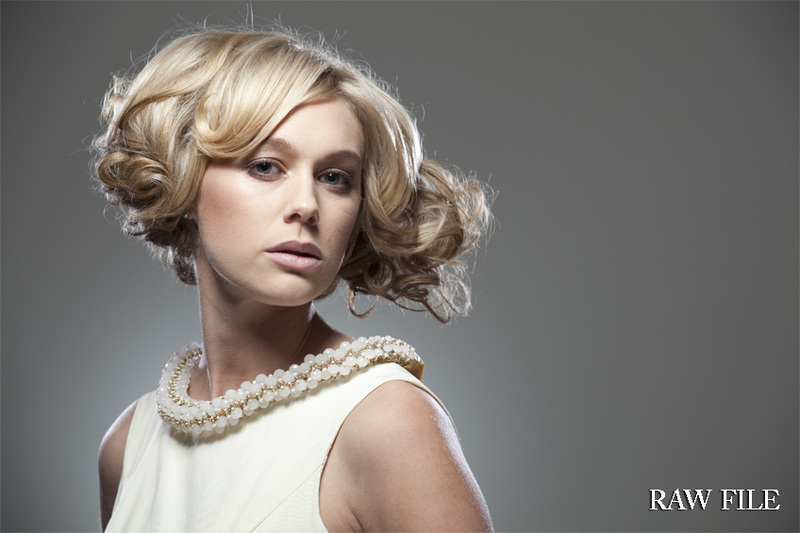 Professional retouchers are becoming more and more popular in modern photography as the bar keeps rising for what is accepted as the norm for the finished image. Ad agencies will all have 'in-house' retouchers who are overseen by art directors. Their job is to maintain a consistent style from the retouchers and help ensure that all the images leaving the agency represent the agencies brand. Retouching is seen as highly skilled and important work too, 'in-house' retouchers in London UK can see salaries in excess of £50k (2010) and in New York skilled retouchers can summon $150 to $300 an hour. As for the independent freelancer, competition is incredibly fierce. As an independent retoucher you can be based anywhere in the world and that means they are competing on a global scale for work. As a result, the competition reflects the cost and prices vary greatly but it seems more common to charge by the image rather than by the hour. For large scale editing like weddings and other social events it can be $5 per image for basic colour correcting all the way up to $25-$100 per editorial image that requires a lot more more time and skill. Of course as with any industry there will always be those who seek to capitalise on a market that doesn't require the transaction of a physical product and the so-called 'retouching factories' will always have the volume to crush the bottom line. The standard of these retouching conveyor belts varies drastically. There are those who offer a complete professional workflow solution for busy wedding photographers to the ever increasing rise of 'retouching factories' emerging out of China and India. From what I have seen, the quality is reflective of the cost, they offer image manipulation for $0.35 per image, with that price going down if you are supplying a volume of images which is insane to me. Currently as photographers we have a huge choice for how our final images are going to look and if we don't have the skill or time to implement a comprehensive workflow there has never been so many options open to us. Although there is little in terms of actual post pro done here, even small decisions like skin tone and colour balance can have a big overall impact on the final outcome. Before on the left, final on the right. Photography and retouching by Jake Hicks Photography. I think every photographer has a different approach to achieving that final image but however we get there we should maintain a consistency. No client wants to see a portfolio of photographs that look like they have been taken by several different people. They want to know that when they hire you they are getting a specific style, they don't want to take the risk that you may produce an image for them that they might not like. This might sound obvious but I have seen portfolios of photographers who mix their own retouching in with that of professional retouchers. The result is painfully obvious and this will sound alarm bells in any clients mind. Whether you decide to keep creative control yourself or outsource the images to professional retouchers, it is important to maintain a style that a client can buy into. It may well be necessary to accept your limitations and take advantage of a professional retouchers skill to give your work the final polish. Ultimately they buy both but this varies based on the industry we work in. Personally with my hair and fashion shots I know my clients are expecting to see a very high level of retouching in their final image and I am aware that I must maintain this standard of retouching to maintain the perceived standard of my photography. Conversely though I feel that this retouching standard is less important for wedding photographers and photojournalists as their skills lie in capturing the moment not in having the latest 'dodge and burn' technique in Photoshop. As photographers we all have to deal with some level of post production and ultimately it's down to the individual to decide whether to maintain complete control of the creative process or if through time constraints or skill level decide to outsource the task. Thankfully though there has never been so much choice in regards to finding the perfect retoucher to match your style and requirements and the digital era has literally opened up a world of retouchers to choose from. If you do decide to use freelance retouchers though, take the time to choose somebody that shares a similar vision and then maintain that relationship, as a photographer you will evolve, ensure that you have a retoucher who can evolve with you. It is a creative partnership and any retoucher is playing a massive part in representing you and your work to your clients. As always if you have any questions then let me know and I'll do my best to answer them as quickly as I can. Also, If you're new here then feel free to join our very active community of like minded lighting-nerds (c'mon, admit it, you're one of us :D ) on my Facebook page. I'm currently running a retouching contest where the winner gets their image retouched by myself plus I'm always discussing lighting ideas and offering feedback on community images over there too. A very big thank you to everybody who took part in this article, especially to the retouchers who took the time to provide me with a valuable insight into their profession.